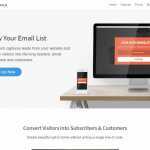 MailOptin is a powerful lead generation and email automation plugin for WordPress sites. 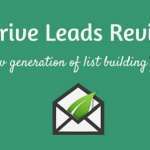 it is a complete all-in-one list building solution with tons of features that will dramatically help you grow your email list faster. It is built to collect email addresses from anywhere within your site using different opt-in form types that you will create, deploy and test for optimum result. Unlike other alternatives, MailOptin goes a step further to ensure your email list subscribers, readers or customers are nurtured and constantly engaged using its suite of event-triggered and automated emails including new post notification and email digests. MailOptin is perfect for business owners, bloggers, designers, developers, photographers, and everyone else. Click Launch Trigger for 2-step optin. In terms of simplicity, the plugin has responsive design and the options are straight-forward. Every form you will create and deploy using MailOptin can be fully customized. There are really no limitations. Creating your first opt-in form can fly within few minutes because there is no need to be a graphics pro or a legendary programmer. Everything you need to have mastery over your list building plan can be easily carried out on the plugin’s dashboard. One handy attraction of the plugin is the quick description of every option that makes setting up the plugin very easy. MailOptin has a very simple graphical user interface that can be used by anyone. This means you need to be a graphics designer neither do you need to be a programmer. You just need to install, activate the plugin to start deploying opt-in forms and start your list building without any hassle. The plugin is super easy to use; from start to finish, you will get in the flow comfortably. If you ever need clarity on any part of the plugin, simply search the term on the plugin’s knowledge base area to give you a detailed explanation. 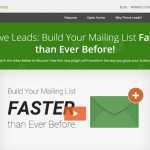 MailOptin has a free version available like you would expect, it comes with limited access to options needed to grow an email list. 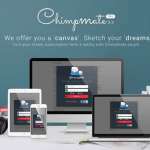 Nevertheless, to get access to more features and options, you will need a premium license. Lite – Free for access to three optin campaigns, limited email campaigns, and templates. Standard – $69-$99 per year for unlimited optin campaigns, exit-intent, sidebar forms, before/after post forms and email support. $69 gives you a license for one site while $99 will open up the plugin for three sites. Check the official pricing to see more detailed features associated with each pricing plans. How Do You Integrate MailOptin With Email Service Providers? Support for email marketing service providers is huge; MailChimp, Sendy, Constant Contact, Campaign Monitor, Drip, ConvertKit, AWeber, MailerLite, EmailOctopus, MailPoet GetResponse are some of the major service providers with full integration support. Integration is simple; from the dashboard, you can connect directly to your email marketing service provider or by associating an API which the plugin will help you locate from your service provider account. 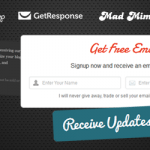 MailOptin does popups excellently while still being able to pull off other amazing opt-in form types. 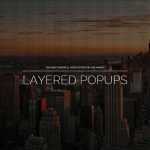 Lightbox: Trigger beautiful and attractive popups to your visitors. 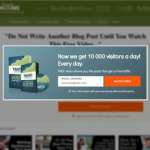 Popups remains the best way to grow your email list when done properly. In-Post Optin: You can display your opt-in forms at the top or bottom of your post just configure your opt-in from the dashboard and get it started instantly. Notification Bar: Simply deploy opt-in forms on the top of your site. Slide-in: Let MailOptin display slide-in opt-in forms at the bottom corner of your site. Sidebar/Widget: Sidebar opt-in form is generally for the sidebar placement, you need to place this opt-in form in a widget area that is visible to every visitor on your site. This means that you can display what you think it’s the right opt-in form at the right location. Your choice will be tracked using the built-in analytics. Alright, let us create our first popup opt-in form using MailOptin. At this point, you must have integrated MailOptin with your preferred email marketing service provider on the “Connections” page. Head over to the “Optin Campaign” page and start creating opt-ins. We have decided to create a popup opt-in form for the purpose of this review, so we will simply click “Add New” right in the opt-in campaign page to create a Lightbox opt-in form type. 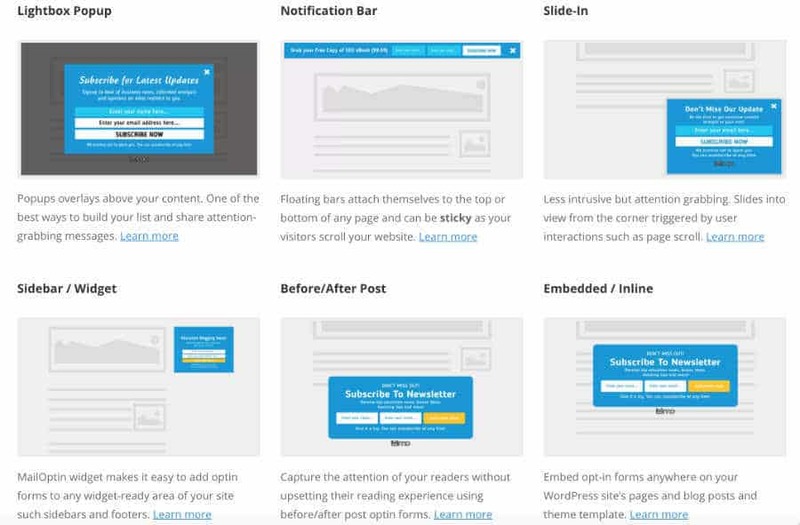 Here are some of the attractive templates available for instant deployment to your visitors. 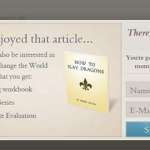 With a few click, you can dramatically transform your opt-in form. Thanks to its intuitive form builder. On the left hand of the panel, you will see a bunch of features you can deploy to get the desired result you want. Everything on the visual editor is pretty straightforward. You should be able to finalize the idea of your opt-in form in next to no time. Once you have customized your forms to blend into your site’s design, then you can deploy them without wasting further time. All you need to do is toggle the button on the top left corner of the visual editor to show a blue color which means the form is live. You can also turn on your opt-in form by accessing the “Optin Campaign” page. From here you will see a list of your opt-in forms; you can either turn them on or turn them off. 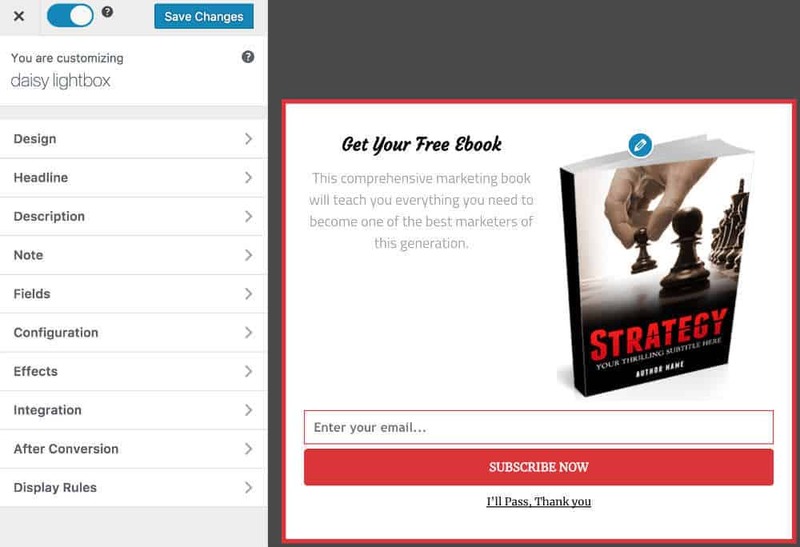 Well, popups remain one of the best ways to convert leads quickly. 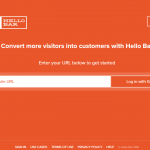 It can be regarded as better than any other type of opt-in. However, using popups must be done with discretion. It has to be done in such a way that it doesn’t distort user’s experience. 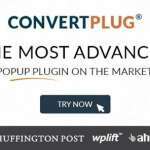 One of the extraordinary things of MailOptin is that there are a number of features which can make your popups less intrusive and highly converting. This feature ensures that your opt-in campaigns are only displayed when a visitor is about to leave your website. MailOptin exit intent technology tracks visitors’ behavior and mouse movement on your website. Immediately they try to leave your site, your opt-in will be automatically triggered, which will be an instant success if paired with offers that are difficult to ignore. You can also decide to show your popup opt-in form after a visitor or reader scrolled down a certain percentage of your site. This is a less aggressive method of collecting emails; it ensures your visitors have interacted with your site by scrolling down to some extent before they are faced with a decision to opt-in to your list. Some internet marketer loves to collect emails from visitors who don’t just visit a page and exit. They believe a user who interacts with more than one page on their sites is more serious than a one-page visitor. With MailOptin, you can trigger popups only to visitors who have visited the second page of your website. On a side note, you can also decide to increase the page number from two to three and so on. After Getting a Subscriber, What Next? MailOptin takes care of every detail of the progress of a successful email list building campaign. So, what kind of response do you want to display after a reader subscribes to your mailing list? There are several things you can do; on the plugin, there is an intelligent feature called After Conversion which basically gives you control over what you display to your new subscribers on your website. You can trigger a success message, redirect new subscribers to URL or close the opt-in automatically. Monitoring your list building progress is very easy on MailOptin. 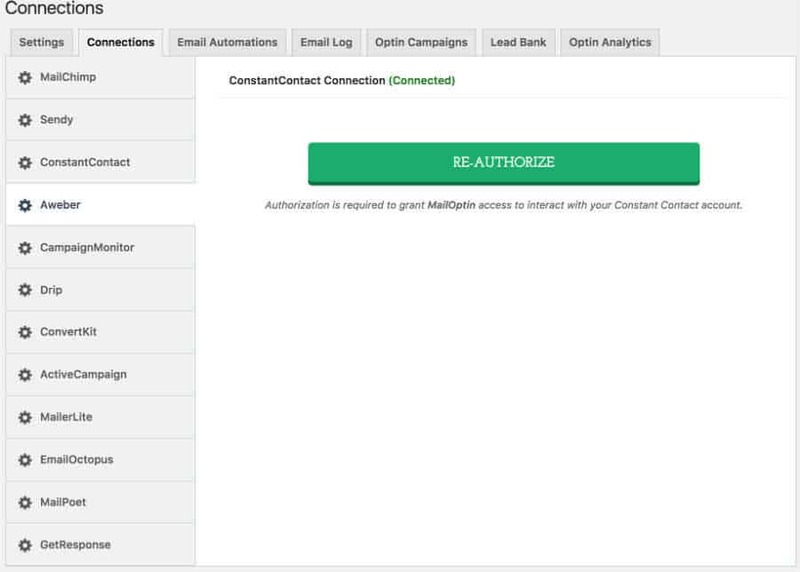 The built-in Optin Analytics gives you a comprehensive view of how all of your opt-in forms are performing. You can track information like the number of impressions, subscriber’s count as well as conversation rate. From there, you can make necessary changes to increase conversion. What Other Features Does MailOptin Have? Time Delay: MailOptin can trigger an opt-in form only after a user spends a specific amount of time on the site. 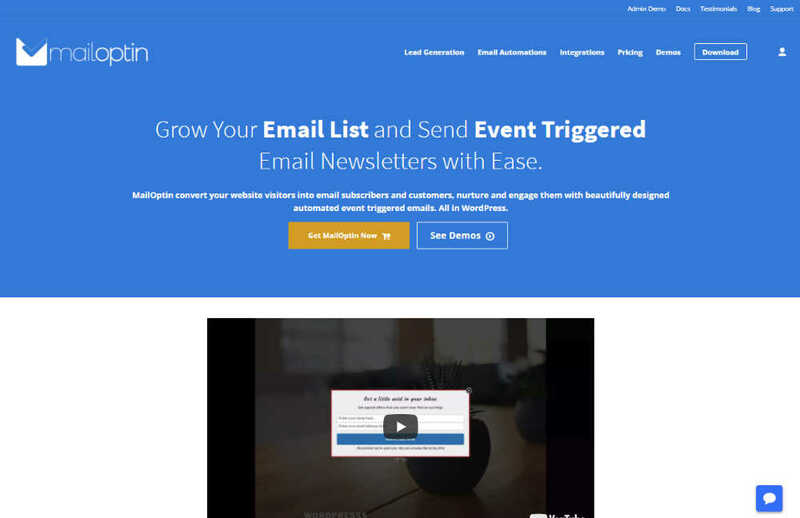 New Post Trigger: Eliminate manual creation of newsletters after publishing new posts and settle for an automatic trigger of newsletters to your email subscribers after a new post has gone live. Click Launch: MailOptin can trigger an optin when a user clinks a pre-configured link on your site. This is used to collect emails from users after giving them offers that require their subscription for access. Page Level Targeting: Enables you display opt-in forms to an area in your site in other to harvest targeted emails and deploy offers to the right people. Full Customization: Add effects to your opt-in form type, edit the image, image orientations, borders and blend your opt-in with your website design. Ultimately, MailOptin is a complete list building solution. It is a time saver packed with several features that make building your list easier. 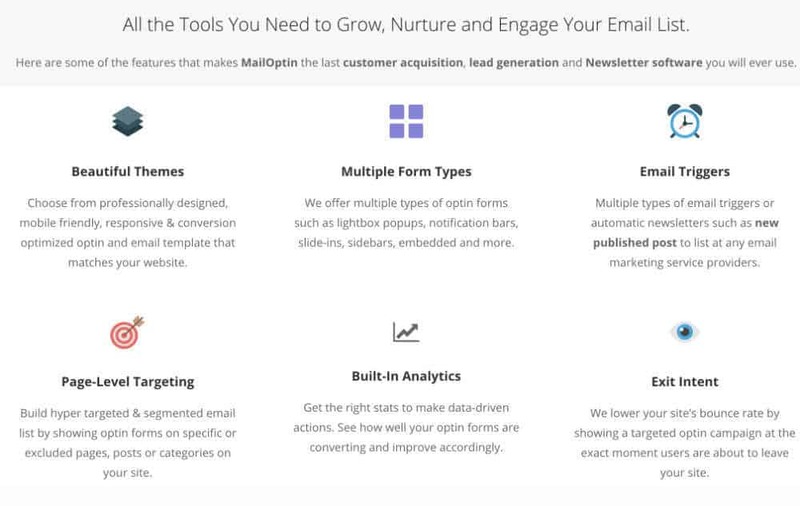 Without a doubt, if you want to be really serious about building an email list on your website, it is important to invest in a substantial lead generation tool like MailOptin. Offers a wide array of features. Excellent support ready to help. 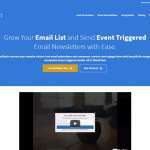 Integrates with popular email providers.